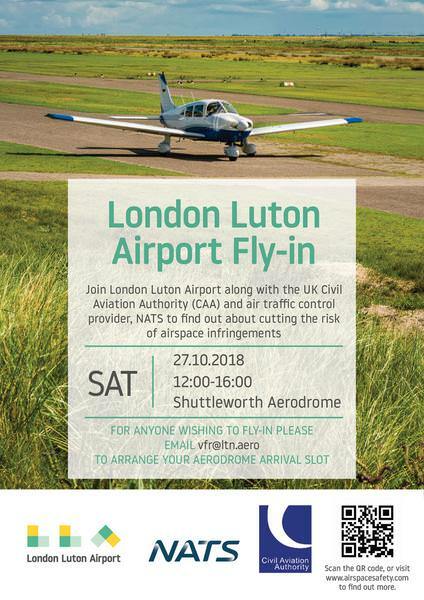 London Luton Airport (LLA) is hosting a fly-in event for local general aviation pilots at Old Warden aerodrome in Bedfordshire next month.The event is aimed at providing the GA community with all the information they need to operate safely in and around LLA’s controlled airspace.Representatives from the airport’s Flight Operations team, the Civil Aviation Authority and air traffic control provider NATS will be at the event which will include a number of interactive stands and competitions.All landing fees will be waived for those flying into the event. Last edited by LTNman; 10th Oct 2018 at 12:14. It would be an even better idea if the hosts were to offer their own airfield for the fly-in rather than borrow someone else's! Looking on from a distance, I think the initiative laudable - for some good is never good enough, of course. Having been to both, I'd far rather visit Old Warden than Luton any day! It would be totally impractical to land a number of light aircraft in between the large numbers of scheduled IFR "heavies" using Luton. Was thinking that myself Shy. Never mind the aircraft movements having to deal with the utter prats in security would put me off. I don't go near the place unless someone pays me. The added attraction, of course, is the Shuttleworth Collection! I did the circuit element of my Night rating at Luton. The only other traffic was a Britannia 767. A little while later, I took myself on a tour round the South-East. One of my chosen airfields was Luton - no problem getting prior permission for a Rallye. Walked across the apron and into the (deserted) terminal building to pay the small landing fee. A while later again, I did my IMC rating and did most of the approaches and the test at Luton. We used to get a great service from their RADAR unit until it moved to NATS. Oh, and the first half of the Night rating I did at Stansted - we got staff rates for landing and parking fees as I worked at Heathrow at the time. Gosh, is seems like only yesterday.